TRUMPed: Can Celebrity Nation Escape the President We Deserve? Update: and here’s one more reason we need to escape our Trumped fate; Hillary is vindicated; she saw it coming that Trump’s Muslim comments are used to recruit terrorists. In a nation where celebrity ‘trumps’ all, we deserve The Donald we may wind up electing. Can we escape that fate? Half the country now states they’d be ’embarrassed’ by a Trump presidency. His latest foray into toilet jokes and sexist slurs might please his crowds, but women make up over half the voting populace. Many of us are sick of arrogant men running down women– and running this country. 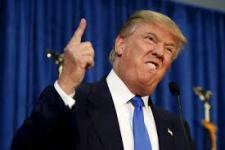 To state the obvious, Donald is the one who embodies the D-word– not only ‘Disgusting’ but ‘Disgraceful.’ For his capital-D Dissing of women, Muslims, Mexicans and much more, Trump trumps all other candidates for Disgraced Celebrity of 2015 (his second time claiming this prize!). Thanks, Penny and Luis. As Will Ferrell as George W. Bush observed on SNL, the GOP voters do not want someone who knows how to govern. They want someone who is ‘Cuckoo for Cocoa Puffs‘… Our country is irreversibly and certifiably Cukoo for Celebrities. We made Trump what he is today. Will we make him President as well?